Arctic Lodges is placed on what is said to be the best location on the lake. With little to no pressure on the fish, our guests are able to catch and release well over a 1000 trophy fish every season! Come experience Arctic Lodges and see for yourself how thriving the freshwater ecosystem is below the waters of the legendary Reindeer Lake. 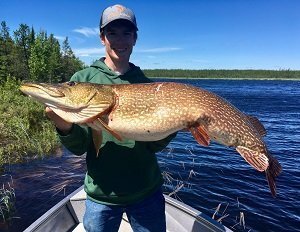 Almost all guests of arctic lodges will catch a “master angler” northern pike, with many more catching pike over the 45″ mark and bigger. each year a few anglers are fortunate enough to bring in a 50″ and sometimes even bigger! Arctic Lodges operates 18′ Crestliner boats with a raised casting platform and all the modern amenities. All boats are powered by 4 stroke outboards. The entire fleet is equipped with comfortable swivel, pedestal seating, livewells, coolers and all the modern electronics available to today’s anglers. Our experienced guides are friendly and trained in targeting all species by any method of angling possible. Learn how our professional guides can help you on your next fishing adventure to Arctic Lodges. 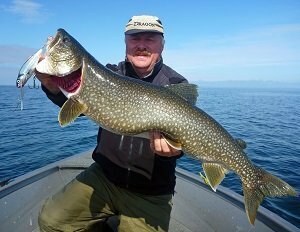 Fly fishing for trophy Northern Pike, Lake Trout, Arctic Grayling and Walleye has become a growing trend, and we encourage giving it a try, even if you have never before held a fly rod.